This book, along with its photo-format companion volume, CAFO (Concentrated Animal Feeding Operation): The Tragedy of Industrial Animal Factories, has been a long time in the making. It is not the first of its kind. Our foundation, the Foundation for Deep Ecology, has published several large-format books and companion readers over the last seventeen years documenting various ecological outrages. These volumes have exposed the fallacies and outright pathologies of industrial agriculture and industrial forestry (Fatal Harvest, The Fatal Harvest Reader, and Clearcut); mega-scale dam building for hydroelectricity (Patagonia Sin Represas); public lands livestock grazing in the American West (Welfare Ranching); illconceived fire suppression policy (Wildfire and The Wildfire Reader); motorized recreation (Thrillcraft); and mountaintop-removal coal mining (Plundering Appalachia). 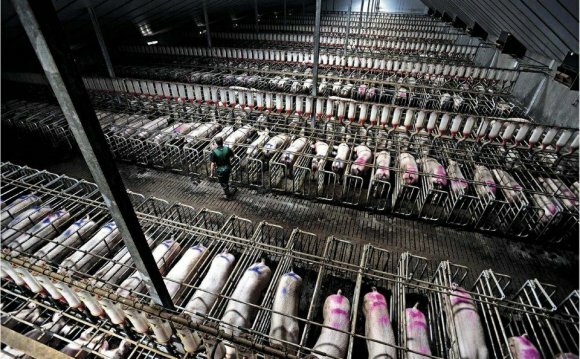 With The CAFO Reader, we again turn our attention to the horrors of industrial food production, this time with a focus on factory “farms, ” which are of course nothing of the sort, having little connection with honorable agrarianism and everything to do with cruelty and environmental abuse in the pursuit of corporate profit. Through the years, as editors and producers of these books, we have come to recognize a common thread that ties them together. Wherever we look closely at the most egregious assaults on the Earth’s beauty and integrity, we find that the abusive behavior flows from a root cause: a technological and industrial approach to production, land management, recreation, or other economic activity. Time and again we are struck by the fact that this reductionist, narrow, techno-industrial paradigm when applied to a production system ends up diminishing nature, accelerating its demise, and unbalancing ecosystems. In short, we conclude that within this fundamental industrial framework lies the answer to why the world is falling apart and why we find ourselves, one and all, ensnared in the massive social and ecological unraveling we call the “ecosocial crisis.” For it is not only natural systems that are in crisis—as manifest in burgeoning rates of extinction, collapsing fisheries, and a rapidly warming planet—but also human societies that depend on healthy ecosystems. Around the globe, natural and human communities are in decline or in some state of crisis, collapsing or having already collapsed. Industrialism, the godchild of this mechanistic worldview, lurks behind every tree and is responsible for the deeper and deeper hole we humans are digging for ourselves. In CAFO, we recognize the logic of industrialism applied to domesticated food animals. The result is a tragic, pathetic, and inhumane method of raising animals in factory farms to produce meat, milk, eggs, leather, fur, and nonessential culinary luxuries such as liver pâté. Living creatures are treated as machines, reduced to “units” in an assembly line of protein production by corporate food purveyors, with the individual animal’s suffering ignored. This is the kind of atrocity for which the word evil seems too meek and mild.